I recently completed a "Keepsake" to commemorate the 250th Anniversary of Horatio Nelson. This was a commission from The Kings Lynn Arts Centre. The keepsake was engraved on a large block of English boxwood. 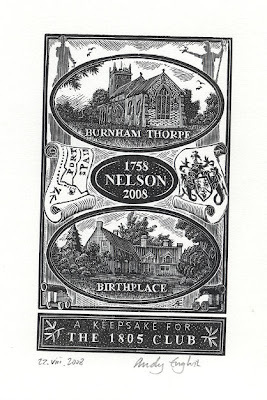 The design has many elements, including Nelson's birthplace, Burnham Thorpe church, The arms of King's Lynn, A map showing the position of the Battle of Trafalgar and the columns at Trafalgar Square and Great Yarmouth. These photographs show the progress of the engraving ("click" on the images to enlarge them). Here is the partly engraved block with the original drawing that I worked from. The finished block has been fixed to the bed of an Albion Handpress; ink has been rolled onto the block ready for printing. I don't often appear in this blog.Here am I "pulling" an impression. Finally... the keepsakes are printed, dried, trimmed, numbered and signed.... ready for delivery. They will be sold at an extremely modest cost at the Fermoy Gallery of the Kings Lynn Arts centre. the exhibition runs from 27th September until 1st November. Summer, such as it was, is nearly at an end and the harvest, such as it has been, is nearly in. Here is the story of my engraving for the BAREN exchange number 37, which had the theme of a journey. It brought together two things that I had been saving, namely, the idea of making an image based on Cornish gardens and using a lovely natural "round" of boxwood sent to me by blockmaker Chris Daunt. I started to engrave the block in public at Art In Action (see previous post). 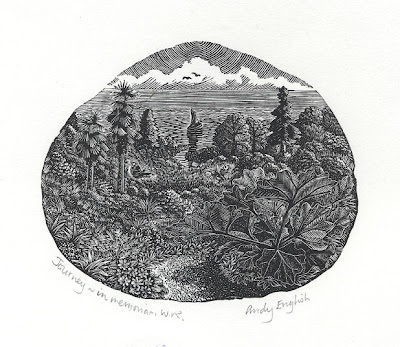 I worked on a very detailed area of plants at the bottom of the image and then moved on to engrave the sky. ...until the engraving was finished and I could take a proof. Here is the final image. The print is in memory of Wanda Robertson who passed away earlier this year. I bid farewell to another old friend, my Vandercook proofing press which I used to proof and edition my engravings from 1999 until the arrival of my first Albion press. I have sadly neglected it in recent years and it has now gone to a home where it will be loved and used. So I will end by raising a glass to old friends. A glass from a bottle featuring one of my engravings on the label. I have engraved several designs for wine labels over the last few years. This is the first one that I have seen "on the shelf"; I spotted it in the shop attached to my local service station, of all places.